(Newser) – For 60 years, one of the earliest paintings by Frida Kahlo hung on the wall of a California home, unseen by the public and its location a mystery, Reuters reports. Now it's expected to fetch up to $2 million at auction. 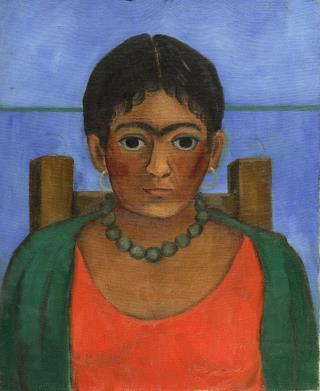 According to Fusion, Kahlo painted Niña Con Collar—or "Girl With Necklace"—in 1929 when she was just 22. It was never publicly displayed, and Kahlo hung on to it until her death in 1954. "The painting would hold a particular meaning to her," according to Sotheby's, which is auctioning Niña Con Collar on Nov. 22. "It proved to be a spring well of ideas for works to come." After Kahlo's death, her husband gave the painting to a woman who helped the artist in her studio. On the dozenth or so glance at this painting.. crapballs I'm starting to love it too wth!! A closer look at the waves that run through the painting elevates it for me both thematically and artistically. Not quite as simple as it appeared at first glance. Amazing what her work is worth though. Grade school level painting.Check out a couple of Dutch masters and compare the complex depth,colors and fine details.